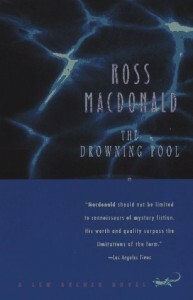 Another good, very good in fact, novel from Macdonald. About equal in quality with The Moving Target. The plotting is adequate, the story moves along nicely. Good dialog, etc. etc. The best thing about the first two novels is the character of Lew Archer. Archer is the epitome of the hard boiled, tough talking, wise cracking private detective. For an example, I will turn to a page randomly for a wisecrack*. Archer, upon confronting someone he had shot in one arm earlier in the book, "I swung the door wide open and waved my gun. His fingers were twisting on the leather button that held the flap over the pocket. 'get in' I said. 'you don't want it to happen to the other arm, I have a passion for symmetry". I am happy to read that the Archer books don't peak until about Book 11 or so (The Zebra-Striped Hearse) and the quality stays high throughout. I look forward to continuing this fine series.